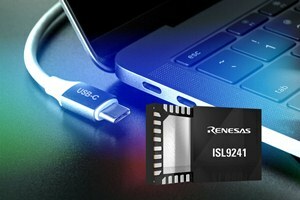 Renesas Electronics Corporation, a supplier of advanced semiconductor solutions, introduced the industry’s first USB-C buck-boost battery charger to support both Narrow Voltage Direct Charging (NVDC) and Hybrid Power Buck-Boost (HPBB) charging for notebooks, ultrabooks, tablets, and power banks using the reversible USB Type-C connector cable. The ISL9241 delivers charging, system bus regulation, and protection features using NFETs for highest efficiency and bill of material (BOM) cost optimisation. The charger can operate with only a battery, only an adapter, or both connected. It takes DC input power from conventional adapters, travel adapters, and USB Type-C power delivery (PD) ports, and safely charges battery packs with up to four-cell Li-ion series batteries. In NVDC mode, the ISL9241 automatically selects the adapter or battery as the source for system power. NVDC operation also supports turbo mode by turning on the BGATE FET to limit adapter current at the adapter’s current limit set point. NVDC is the ISL9241’s initial startup state before the system controller’s firmware changes the configuration to HPBB. In higher power HPBB mode, the ISL9241 supports bypass, bypass plus charging, reverse turbo-boost mode, and reverse turbo-boost mode plus charging.